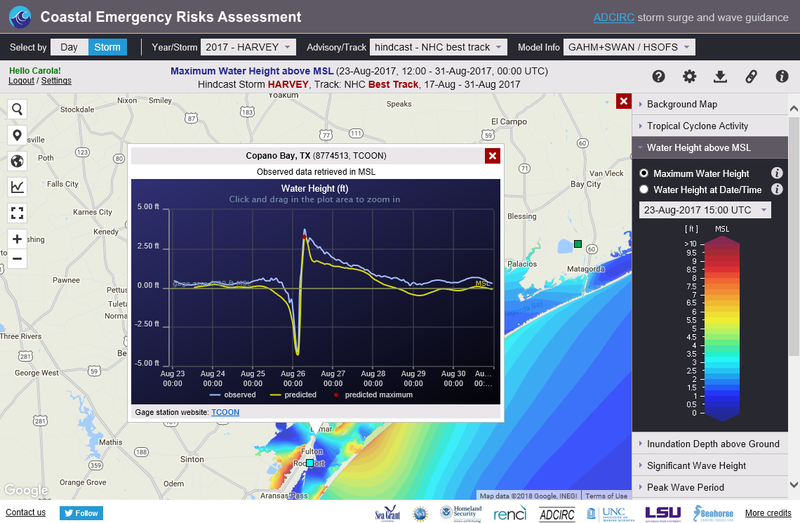 During Hurricane Harvey, the Texas State Operations Center used the live storm surge model guidance from ADCIRC on the CERA site exclusively to plan and execute the pre-landfall search-and-clear operations and make other official decisions impacted by storm surge. At the same time, the potential storm surge inundation maps from the National Hurricane Center were used by the local National Weather Service forecast offices to communicate the surge threat to the public. The Texas Department of transportation decided the timing of the Aransas Pass Ferry shutdown based on live CERA storm surge guidance for sea conditions at the ferry landing. The Texas Task Force 1 Search and Rescue team used live storm surge model guidance for peak wind speeds at critical locations. Additionally, the magnitude and timing of surge predictions were used to select critical locations, anticipate road access changes, and differentiate between time periods when movement was possible and when it was not. The live storm surge model guidance on CERA showed relatively low surge impact in Rockport. Clicking the tide gages on CERA showed that model guidance was dead on; remote sensing images also corroborated the ADCIRC model guidance. The storm surge forecast guidance showed no impacts in Corpus Christi and this was corroborated with water level gages from several agencies. Using the live storm surge guidance on CERA, local emergency managers were advised by the Texas State Operations Center to avoid an unnecessary additional evacuation of 100,000 citizens from the Sugarland area. Louisiana State University. Center for Computation and Technology & Louisiana Sea Grant. Copyright © 2019 Coastal Emergency Risks Assessment (CERA). All rights reserved.